Voted "Best Manicure & Pedicure in Orange County"
GLO Nail Bar is the premier source for fashionable nails, custom spa pedicures and exceptional service. Inspired by the spirit that is the "SoCal" lifestyle, each salon boasts customized decor and furnishings that are a blend of comfort and functionality for a look that is modern and chic. At GLO, attention to every detail is made to ensure every every client has a 5-star experience. From our wide selection of complimentary beverages including wines, champagne, mimosas, as well as non-alcoholic drinks and luxurious comforts to an unmatched selection of custom specialty spa pedicures, GLO Nail Bar is in a class of its own. Industry professionals, various media, and customers all love GLO. 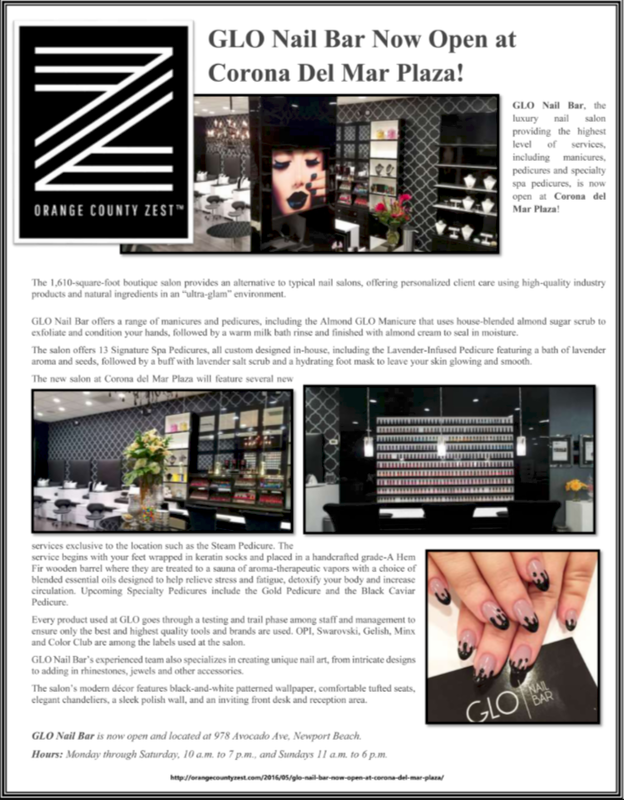 Modern Luxury Magazine recently called GLO a “Pedicure Paradise” and awarded GLO “Best Pedi Spa," (2015 Salon & Stylist Awards) - Modern Luxury/Riviera Magazine. 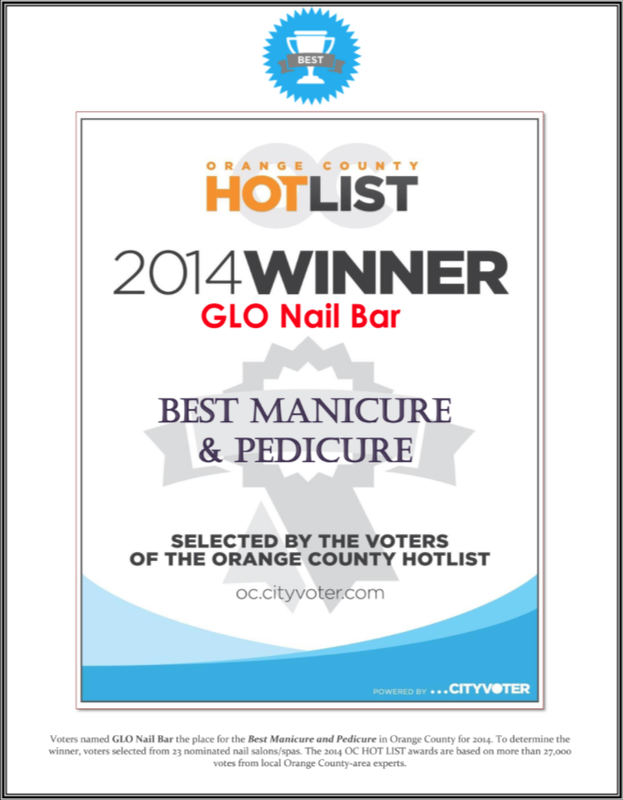 GLO was also voted the “Best Manicure & Pedicure in Orange County” – The Orange County Hotlist, “Best Manicure & Pedicure in OC” - OCWEEKLY, and “Best Place for a Manicure in O.C.” by Los Angeles Times. GLO has also been spotlighted on E! Channel’s television series The Orange County Housewives and BRAVO TV's Botched. Everyone has spoken - GLO is the place to be for all things hands and feet! So what are you waiting for? Come and experience GLO Nail Bar for yourself and be prepared to be taken on sensory journey that will rejuvenate your mind and body and leave your hands and feet looking beautiful. "BEST MANICURE & PEDICURE IN O.C. 2016"
"BEST MANICURE/PEDICURE 2015. "BEST OF O.C. 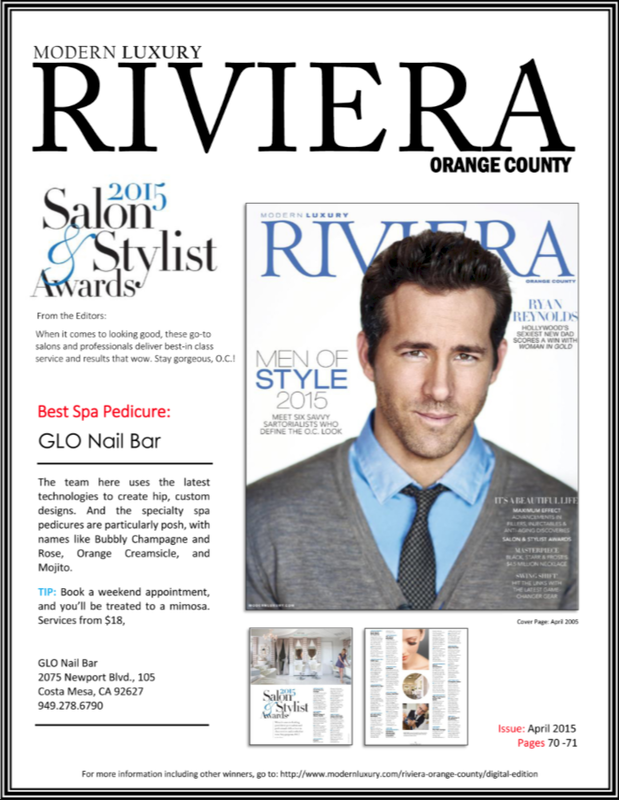 “BEST SPA PEDICURE.” 2015 SALON & STYLIST AWARDS. "COOL SALONS: GLO NAIL BAR IN COSTA MESA"
"SALON PROFILE: GLO PUTS A TWIST ON TRADITIONAL NAIL TREATMENTS"
"TALKING SHOP: GLO BRINGS OUT THE ART OF NAILS"